Online ticket purchase is now closed, please purchase your tickets on the day of the event. - Click here if you want to volunteer for Pancake Breakfast. We need 1 more volunteer please - 7:45-9:30am - on call helper. Thank you! View the performance schedule time slots for all the groups for Pancake Breakfast. 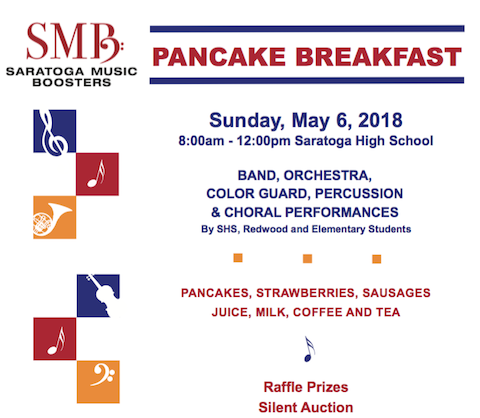 Please join us for Saratoga Music Boosters’ annual Pancake Breakfast on Sunday, May 6th, 2018 from 8:00 a.m. to 12:00 p.m. Pancake Breakfast is a spring music festival with performances by students of the bands, orchestras, choral groups, and color guards of the Saratoga elementary, middle, and high schools. This is the last major fundraiser of the year and all proceeds support Saratoga Music Boosters. Pancake Breakfast is always a very popular and festive spring event. It is a great opportunity for community members to mingle and enjoy a "homemade" breakfast of pancakes, sausage, and strawberries while listening to great music! Come by the Saratoga Music Boosters Silent Auction & Raffle during this year’s Pancake Breakfast. Silent Auction ends at 11:45am. Raffle prizes will be announced at 12noon. Winners need not be present to WIN. We have many Silent Auction prizes such as: 15 hours of design consulting services from Timeline Design, SAT group classes from AJ Tutoring,wine from Baccarossa Winery and Lonehawk vineyard, wine tasting packages, watercolor painting by Peter Kuo, Float Realm, facial package, YMCA 3 month membership, college counseling session with Felicia Fahey, Angela Sun Consulting ACT/SAT Prep 1:1 tutoring, and of course items with our music teachers and Admin such as lunch at Basin Burger Bar with Paul Robinson, SF Symphony with Mr. Boitz and more! Join the Fun events: Chinese Calligraphy Class & Tea Party, and Dosa party. Buy it Now items include gift cards to local business at a discount such as Blue Door, Mio Vicino and more. Don’t miss your chance to come and shop while you eat and enjoy music! If you would like to be a Donor or Underwriter for our Pancake Breakfast Silent Auction & Raffle, there is still time to join us! We encourage all of our Saratoga families and businesses to share their talents and generosity. Please contact Beth Kingsley at bethkingsley2002@yahoo.com or SMBsilentauction@gmail.com. A big thank you to our generous sponsors. Click here to view our sponsors this year. Order pancake breakfast tickets for $12 and raffle tickets online using our Webstore by Fri May 4th at 10pm. Ticket sales are only online this year or at the door the day of the event. Contact Yashoda Nag at yashodanag@gmail.com for questions. If you choose to buy tickets on the day, the ticket price will be $15.00. Please bring cash or check book to the Pancake Breakfast event to purchase raffles, auction items, gift cards, tickets, and other items. ​We encourage and welcome all parents and community members to attend the Pancake Breakfast. We also need MANY parent volunteers to staff the event. Last year over 100 people volunteered and we anticipate a need for even more this year. For those with students performing, you can work before or after their performance. Moms and dads are needed, some before the event and many on the day of the event. Click here if you want to volunteer for Pancake Breakfast.